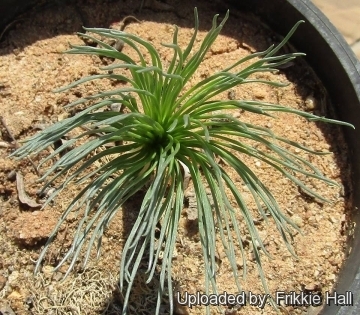 Origin and Habitat: Gethyllis grandiflora grows across the Northern Cape (Richtersveld Mountains to Komaggas), South Africa. G. grandiflora is a widespread, and relatively common species, that occurs as scattered individuals, and not in danger of extinction. There are less than 100 colonies, most of which contain fewer than 20 specimens, and only a handful of the colonies is somewhat larger, but never with more than 1000 specimens. There are probably fewer than 10000 specimens in total. Habitat and Ecology: Desert, Succulent Karoo. G. grandiflora grows on sandy and or stony soils in arid karroid shrubland. 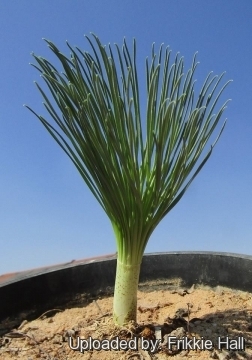 The highly aromatic fruits are eagerly collected and eaten by the Nama people of the Richtersveld, but is unlikely to be causing any decline to the population. In the past plants were illegally collected, but there are no signs of over collecting causing population decline anywhere within this species' range. 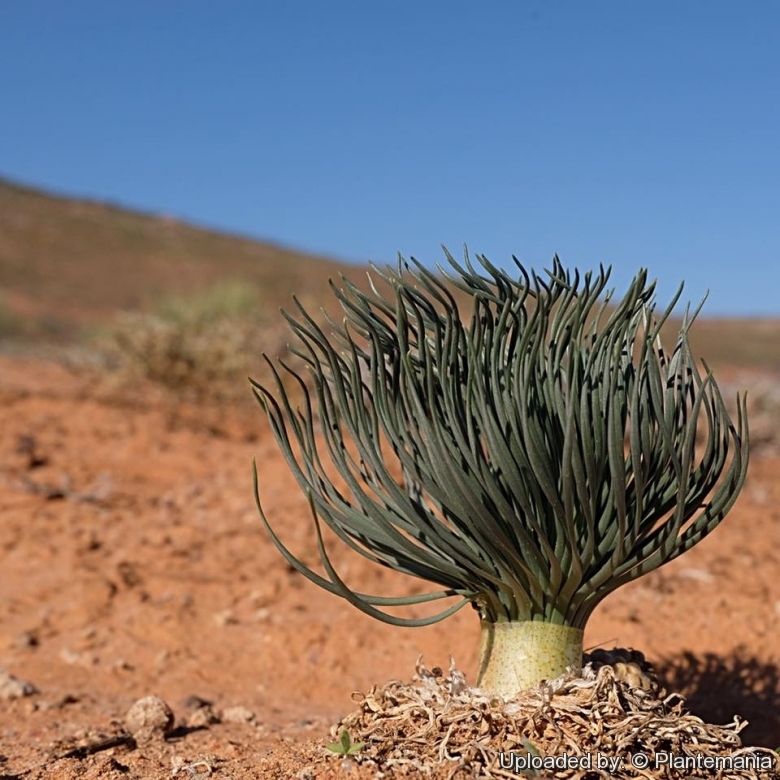 This is one of the few endemic species that survives and even thrives under the intense grazing pressure in large parts of the Richtersveld that is severely overstocked with livestock, and is therefore not suspected to be declining. Description: Gethyllis grandiflora is a beautiful rare geophyte (bulbous) plant of the Amaryllidaceae family. It grows about 20 cm high, and produces cream flowers, with a light orange center. This species can be identified from the beautiful numerous linear leaves that tend to become spirally twisted, all in one fascicle and seen contemporaneously with the flower. Bulb: 5.5 (or more) cm. in diameter; tunics membranaceous, very thin, conspicuously transversely nerved, without color. Leaves: Numerous (45 or more), mostly withered during anthesis, all in the one fascicle seen contemporaneously with the flower, almost all herbaceous, narrowly linear, amout 4 cm long above the surface of the ground, 2-3 mm, glabrous, spirally twisted above. 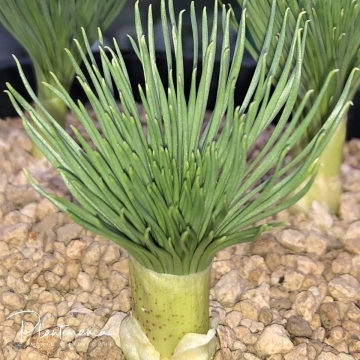 First year seedlings do not show this characteristic spiral. Flowers: About 20 cm high, cream flowers, with a light orange center. Perianth glabrous, white, more or less suffused with rose, the tube 6 mm long, 4?5 mm. in diameter at the base, 9 mm. in diameter at the apex, shortly funnel-form, the segments acuminate, the inner ones always broader than the outer ones, ovate, to 3.5 cm. wide, 5?6.5 cm. long; stamens 6, 8 -1-antherous, the anthers shortly stipitate or with a stipe to 5 mm. long, 1.2 cm. long, greatly surpassing the filaments; style strict, exerted about 8 mm beyond the tube; stigma small.